Fun Life in The Kitchen: Valentine's Day Wine, What along with Chocolate? Valentine's Day conjures up images of wine, roses, and chocolates. 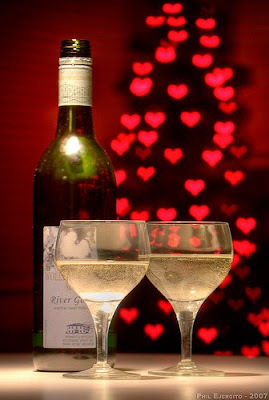 Yet every year young and old lovers alike are disappointed when they try to pair a Valentine's Day wine with chocolate. Either the chocolate overcomes the wine or the wine overcomes the chocolate. The perfect bottle for such a sweet occasion is Louis Guntrum's Scheurebe. Not only is it a very good white wine but it comes in the quintessentially perfect Valentine presentation of a bright red bottle! The Scheurebe grape is similar in character to Riesling but perhaps more food friendly. It is the right price at $16.99 to gift along with a lovely box of chocolates. So, not only does this wine go well with a lovely dinner but it has enough richness but a dry enough finish to pair well with chocolate! This bottle should be on every table of every restaurant on Valentine's day. It brightens up the room and puts a warm smile on every face that sees it.